The wilderness … and beyond! Category Archives: Anything and everything! Can this really be the first day of March, with my garden looking like this? As we struggle on in the winter cold brought about by cold Artic weather pushed further south (while the Artic itself experiences record highs), you do ponder climate change a fair bit. The temperatures during the past week have not been as icy as the prolonged cold spell last winter (down to minus 15-20 degrees C in Dec/Jan 2016/2017) – we’ve only hit about minus 10 this year! But, for goodness sake, it’s the beginning of March. What do I do with this white stuff when I’m supposed to be digging borders? We’ve had months of rain (everyone tells me that during their time in this part of France the winters have become wetter, the summers hotter – my least favourite combination) and then, at the end of February when the sun finally came out, we walked, eyes wide open, into this icy blast. Along the wet February path there were, of course, snowdrops, aconites and the start of the hellebores. Which reminds me, do your Galanthus ‘Sam Arnott’ take a year off? I seem to remember this phenomenon in the past. Last year was great, this year I have one flower. Sad, since he’s my favourite. Semi-double hellebores which the bees DO like! But there’s good, too, in the midst of this cold. I’ve really been enjoying (obsessing, almost), over the effect my new greenhouse has made with my dogwoods, planted for winter colour. And next year there will be a decent mulch, thanks to my new compost bins! And this is the first year I’ve really been able to appreciate my knot garden as it was meant to be viewed: from the house above in winter. Virtually all of the box have been grown from cuttings taken elsewhere in the garden – I can’t experience the pain of box blight or box tree moth and the financial loss as well! It would be too much misery, so I prefer to make my own, and slowly. Also experimenting with yew hedging. The young plants were direct-stuck in the pattern I wanted over a 3-year period (there were some, although not huge, losses). I’ve done this in either June or September, and have noticed a better ‘take’ with the September cuttings (we have warm, long autumns, generally). 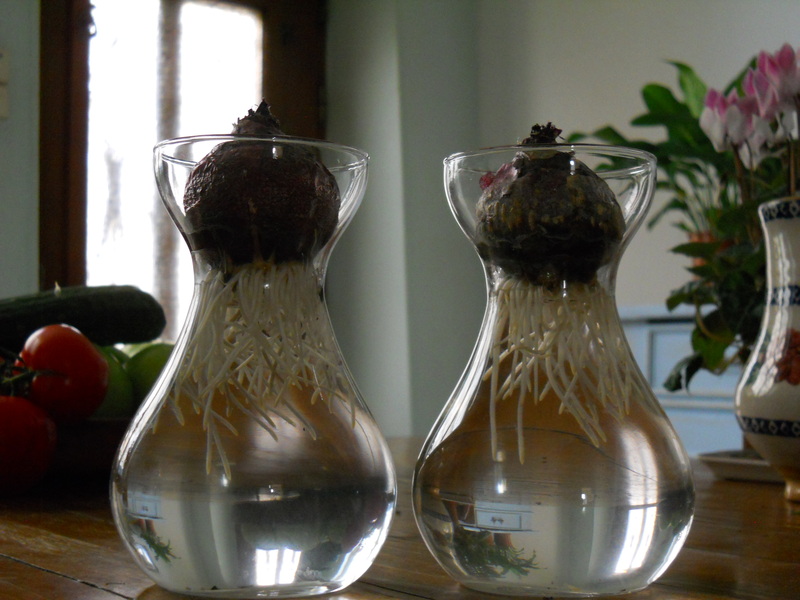 I don’t fiddle with them – just trim the base neatly, remove the bottom leaves and push them in. (Confession: even dispensed with the tidying process last time – we’ll see in the spring). I have now completed the entire pattern, although the smallest, youngest lines in the pattern are not really visible in the pictures you are looking at. I’ve also planted my three Ilex aquifolium ‘Aureo-marginata’ into the Knot Garden – they are supposed to be clipped into spirals. Will I live to see the mature specimens? We gardeners are an undaunted breed, aren’t we? This will be the second year I’ve indulged in a rare financial fling – a tulip bedding scheme in the knot garden. Last year I didn’t plant quite enough bulbs. This year I’ve doubled quantities. I chose 100 ‘Blue Heron’ (fringed, mauvey-blue – I’ve admired it for a while, but never tried it), 100 Cistula (a very pale yellow), and 100 Paul Scherer (a very beautiful dark purple, which looks to be a fuller flower than ‘Queen of the Night’). My plan has always been to bed out new tulips, try colour combinations, in this area (‘play’, in other words!) and then to lift the bulbs and replant them elsewhere (even wild areas) in the autumn. The plan’s a bit pricey! Maybe only 50% more would have been enough to do the job. Dahlia tubers, gladioli corms and seeds, have been pouring through the front door (whenever the delivery men make an effort to get here on the designated day). That’s because I’m starting to panic about the end of May and beginning of June. We are opening the garden to the public for the first time under the Jardins Ouverts scheme and I sure am nervous! Have a look/click on the link above. 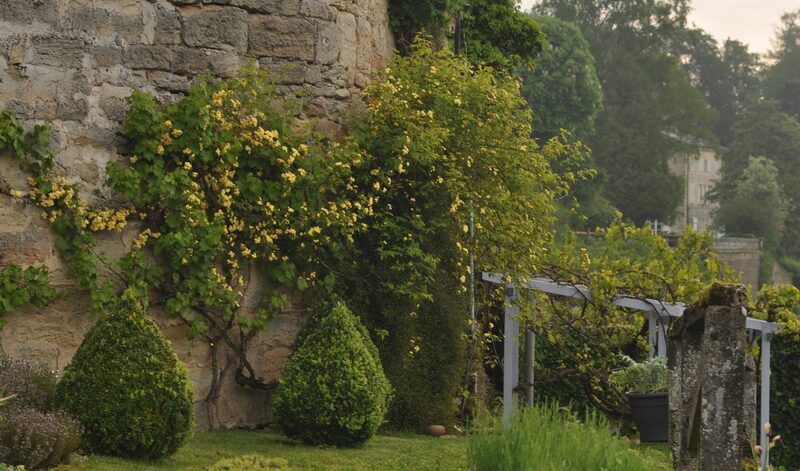 Even if you are not coming to my part of France in 2018, there’s bound to be a garden in your chosen area that pleases. When we get into the beginning of April I will not only be cutting the grass once a week on my own, but also doing all the sowing, planting, etc. Goodness – I am both excited and REALLY stressed just thinking about what I’ve got to do! Then I think about all the glorious colours of dahlias, gladiolus and tulip I’ve bought and I go back to the nicer kind of dreaming. Have a wonderful March, and I’ll hope to catch up with you at some time in the midst of it all. This entry was posted in Anything and everything!, Box tree caterpillar, Dahlias, End of month meme, Gladioli, Hellebores, Knot garden, Propagation, Tulips and tagged Box blight, Box tree moth, Holly clipped into formal shapes, Jardins Ouverts, Propagating box, Tulip 'Blue Heron', Tulip 'Cistula', Tulip 'Paul Scherer' on March 1, 2018 by Cathy. I’m a bit late taking part in this meme, now hosted by Steve, at Glebe House Garden. But I’m too aware that, even just for my own sake, I’ve not been recording the garden as much as I should have been. October has been a very mixed month: heavy, ghastly (and depressing) rain, interspersed with week-long periods when the garden was full of heat and sun in rare old Indian summer fashion. We were just going through one of those sunny spells on the eve of Halloween, the day my photos were taken. The heavy frost wasn’t a complete shock: I checked the weather after dark and managed to rush down and rescue a couple of pots from below, including my precious Cycas revoluta (Sago palm), which always reminds me of time spent working in a Floridean garden, as well as a nice little collection of fancy and scented leaf geraniums bought in the spring. However, thinking back to last winter, perhaps the mercy mission wasn’t quite so essential. My tender plants are kept in a sun room, where the door is usually shut over night and I try to ensure the temperature is always above 0 C in winter. But this is also the exit for our cats into the garden. Usually this door is shut at night when the cats are inside, but I do remember one sad occasion when I came down in the morning to see two little furry faces locked out in the cold and frantically trying to climb the glass, their yelling mouths wide open at the insult. Last winter, however, from about the begining of December to end of January I spent quite a lot of time in Scotland and the Bon Viveur was in charge. Unfortunately he sets more store by the cats than my plants, and the door was left continuously open for them. The thermometer showed me that we’d been down to -6 C in there. The point of the story is that the only things that died were my geraniums, broad-leaved penstemons (the most tender sort) and Helichrysum petiolatum. Oh … and one camellia which, I think, just dried out quite a lot. Cycad, olive tree, Aloysia citrodora (lemon verbena), Melianthus major and Abutilon pictum ‘Thompsonii’, all came through unharmed. Just shows you, doesn’t it? 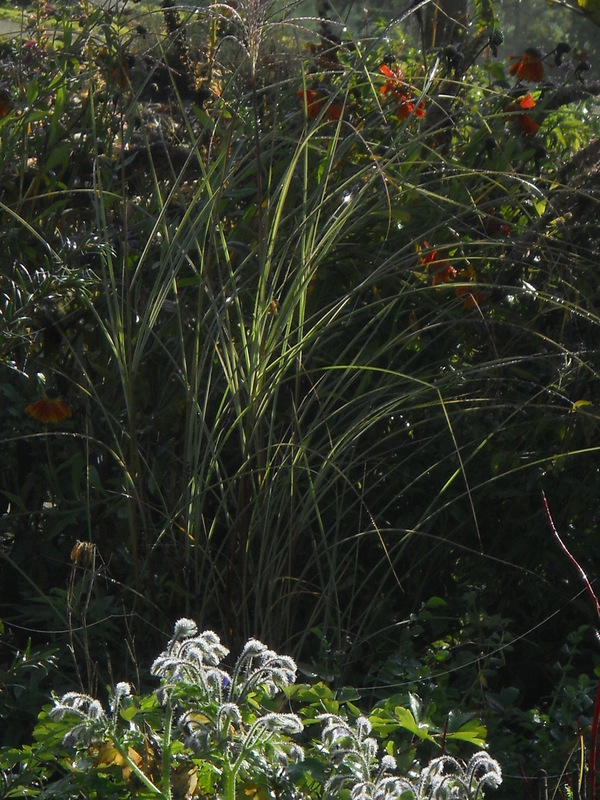 Of course some things, such as my miscanthus and Calamagrostis ‘Karl Foerster’ are in nice terracota pots – they are over-wintered in the sun room for the sake of the pots, although freezing of a plant’s root system can be damaging. But they are all definitely much tougher than I imagine. So, on the morning of 31 October, the garden was looking superb with the heavy frost. The Vine Terrace with the BV’s blue pergola always looks particularly special in autumn (this is where the cycad lives, so not too many steps to lug it up to the house!). From up at the Vine Terrace level I have a satisfying view of the Rose Walk, which does begin to look quite mature. At the moment more than a few roses are still flowering – originally it was planned to be for old roses only, but I’ve gradually added more of the Bourbons (which repeat) and David Austin’s group. So ‘William Shakespeare’ and ‘Gertrude Jekyll’ (Austin) are all still on the go, as well as ‘Mme Isaac Pereire’, ‘Louise Odier’ (Bourbons); ‘Mme Alfred Carriere’ is a great climber for staying in flower right through a mild November. In spite of the flowers, you may have seen in my Wordless Wednesday yesterday that they were cruelly treated by the frost. …and we can move on to the quicker work of putting the frame up. In fact you can see that some of the parts have already been assembled. Then it will be painted – don’t ask, we don’t know if it will work, but that’s not putting us off! Finally glazed – all of this only a year and a few days since the time it was delivered! We move quickly. I was a bit shocked that morning to see that all the BV’s neatly ranged tools had been heavily frosted in the night. and my sweet little butternut squashes were covered in rime too. The BV thinks they look like a line of convicts trying to escape – probably they knew the frost was coming, although I didn’t. Will they survive this and still store well? They were going through their 10-day cure when they were ‘afflicted’. I was going to join in with Cathy’s Tuesday View meme at Words and Herbs, but to be honest the Long Border is so dreadfully weedy that I was quite pleased when she told me she wasn’t going to be able to do it this week. However, turns out I’m shameless and will show you pictures anyway. It’s definitely the finest hour for the hazels before we get to the February catkins. This year they are not going to be allowed to do their thing, so I’ll miss them with the snowdrops. But since all the herbaceous plants and roses are now leaning determinedly away from them at a scary angle, I can’t put the regular coppicing off another year. And their cut stems are terrific for making herbaceous plant supports and weaving into small rustic tripods for clematis. Birch is actually better for the herbaceous plant basket support, because the stems are so supple and interweave beautifully. The cannas that I’ve been bedding out with the aim of creating a tropical look for late summer were badly frosted – fortunately they are root hardy, now out of the ground (with my banana) and in the cellar. The grasses and fans of the crocosmia foliage are about the only thing looking good in the border now – although with the backbone shrubs losing their foliage I’m beginning to get glimpses of the red and yellow winter stems of cornus behind. Gaura lindheimeri – at the front of the picture above – surprised me last winter by surviving temperatures down to below -15 C. I wonder if it is because they were young plants last year? I was told many years ago that plants of dubious winter hardiness come through best if they are young specimens. And the Sedum spectabile do look exceedingly pretty with the frost on them. The Hornbeam Gardens are similarly weedy and messy – on the other hand this is the first year that I’ve been able to look down from above (the walk next to the Long Border) and see that, yes, it is beginning to become what I wanted it to be. Glad I picked my last dahlias and zinnias for the Vase on Monday this week – the frost has now done for them! Interestingly enough the snapdragons look like they still have a bit of mileage left. Have a wonderful November and do pop over and see the other contributions to End of Month View at Steve’s Glebe House Garden blog. This entry was posted in Anything and everything! on November 2, 2017 by Cathy. This entry was posted in Anything and everything!, Tulips, Wordless Wednesday and tagged Tulip 'Rococo' on April 12, 2017 by Cathy. This has been rather an unpleasant week. If I rewind to Sunday night and Monday morning (and look at the pictures I took then), I can hardly believe that everything looks so idyllic. For once I had some help in the garden on Sunday – the Bon Viveur was keen to do some strimming and I was happily weeding and planting. Nice work, given all the lovely rain we’ve had and how beautifully things are growing. Further up the path in the orchard; the twizzly tomato support marks the edge of what will be (I hope) one of two matching herbaceous borders next year – wildish planting to go with the setting. While weeding, I noticed that a bull had entered my neighbour’s small orchard: I chased him off. I hope you are not unfortunate enough to know how much damage cattle can do in the garden? While we were sitting having a glass of wine on the Vine Terrace he appeared in the garden itself – now 9pm and the BV is in his dressing gown (having got thoroughly dirty doing the strimming, clothes spinning in the washing machine). What a spectacle – two mad people rushing about and shouting, throwing stones – and all over a garden that doesn’t boast (at the moment) a single cabbage. Eventually we were successful. But my experience of last year taught me that if he had developed the ‘habit’, he would be back. (Last year it was 9 every morning, 6 in the evenings). I am married to a mini-hero. Faster than you can say ‘shoo’, he was all over the place, turning the garden into Fort Knox. The way into the rather vulnerable, newly planted Hornbeam Gardens (also the cut flower patch). ‘Rambling Rector’ is just beginning to come into bloom. The end of the future ‘espalier walk’ – and a very possible point of entry. Barring the orchard, espaliers etc. at the top of one walnut circle – our little wilderness seems very attractive to cattle. I don’t know why – I could hardly sleep on Sunday night for the nettle stings. Chairs can usefully protect small, precious red oaks. Unfortunately that was probably the happiest moment in the week. I woke up on Tuesday morning to a phone call from the police in nearby Jussey, to say that they had found the car, driver’s window broken, car radio stolen – worse, two of my husband’s precious wheels, of which he was so fond, had been removed. I will never understand how even a perfectly nice man like my husband can actually fall in love with the wheels of a car. Monday morning, looking at my favourite French chateau from my version of Fort Knox. It is now two days later. I am exhausted with being passed around between gendarmeries in two départements and gabbling away in French non-stop with insurance companies, etc. It also seems as if we may not be able to afford to repair the original breakdown problem. They do not automatically make a report in this situation – apparently it is a legal requirement, but I presume if they just ‘don’t bother’ it helps to keep their crime figures low. (They’d rather get the département next door to handle it.) How can this be? Being a gendarme is not an easy job. Apparently they are not allowed to publicly complain about their own situation. They are paid by central government. My friend who sat patiently and waited for me in her car while I was lodging my complaint in Jussey told me that a couple of years ago the gendarmes in Bourbonne-les-Bains went completely without pay for several months. Nobody in the wider population was aware until the wives actually went out on the street and protested. Not many pretty pictures this time, but I hope to do an update on my cut flower garden (still not ravaged by the bull) as well as a report on the roses in the next few days. This entry was posted in Anything and everything! on June 9, 2016 by Cathy. Ok, So I know you all do this anyway and did it when you were knee-high … But I’m a late bloomer. This is the first time I’ve ever grown hyacinths like this. I’m enchanted, can’t stop looking. After just over seven days in my home they look like this. I keep peering at the noses of the bulbs to check for a hint of green. (They looked so shrivelled when I picked them up in Lidl!) Every seven days I’ll post another picture. If flowers are just around the corner, spring can’t be far behind! The other reason for this post is to prove my camera’s still working … although the focus ain’t too hot and it would be advisable (and fun!) to think of alternatives. Maybe the next hyacinth pic will be with the new camera? 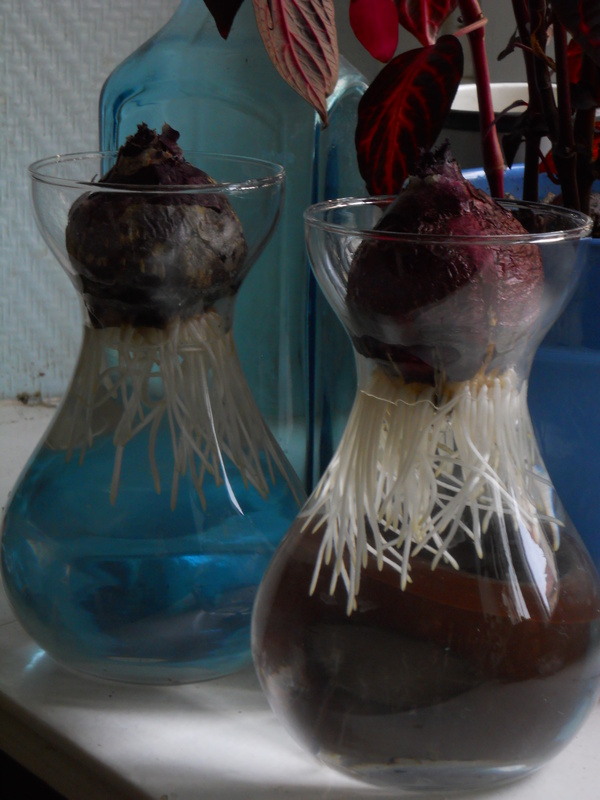 This entry was posted in Anything and everything!, Bulbs, corms, tubers & rhizomes on November 21, 2014 by Cathy. 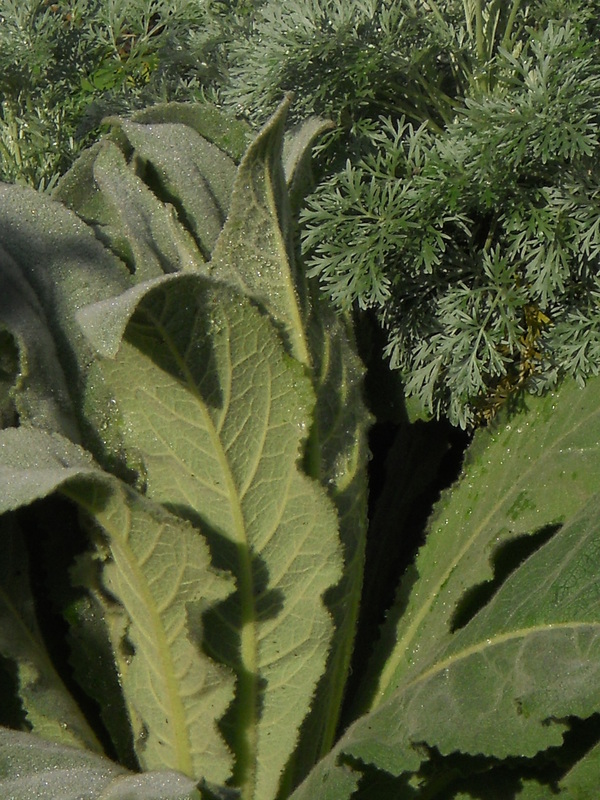 Can you find beautiful foliage plants at Châtillon right now? Well, if you look hard enough … Good foliage in a cold-climate late autumn or winter garden is something that comes with time, knowledge and a bit of careful planning. Strangely enough, the foliage that’s giving me the most pleasure at the moment belongs to a couple of plants that some call ‘aggressive’ because they’ve forgotten where the boundary between ‘weed’ and ‘desirable’ lies. Garden ‘crossovers’ you might call them (it’s my line they’re crossing!). 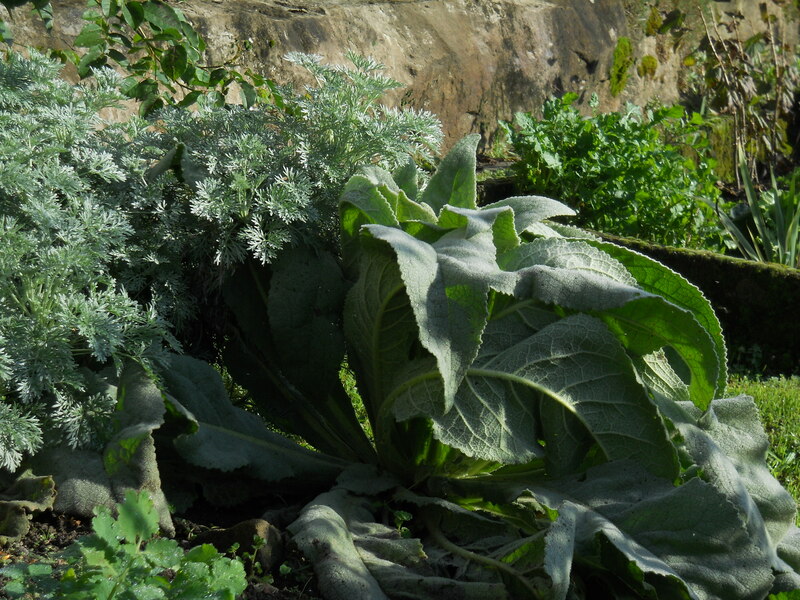 To the left and below are well-behaved Artemesia ‘Powis Castle’ with a favourite thug, Verbascum thapsus, snuggling up. The verbascum, in company with borage, is on a bid to take over every square inch of ground I leave bare – and more than a few that I don’t. Next up, another thug. Bronze fennel. I hope I’ll never be without its foliage effect, but I didn’t reckon on having to cosset it here. When I started planting the garden in 2012, one of the first plants the voles ate were the bronze fennels. Vole damage is scary! It’s a case of now you see it, now you don’t. I’ll never forget the day I pulled on the foliage of a rather expensive (wilting) wisteria and up came a virtually non-existent root system. The bronze fennels went the same way. And so – believe it or not – they were replanted in wire baskets to protect them. I enjoy the fennel from the minute it starts pushing through in April to complement tulips ‘China Pink’ and ‘Queen of the Night’. In 2014 it was chopped back just after the tulips faded, but ‘rose again’ to greet the roses (ha!) and Campanula ‘Prichard’s Variety’. 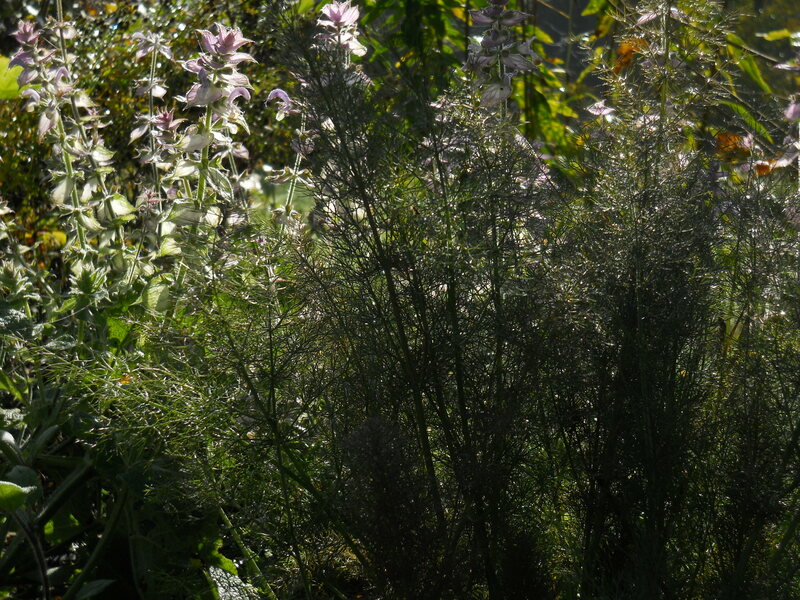 Then I chopped it a second time and it was back again for Leucanthemum x superbum and finally, as in the picture above, some late-flowering Salvia sclarea. 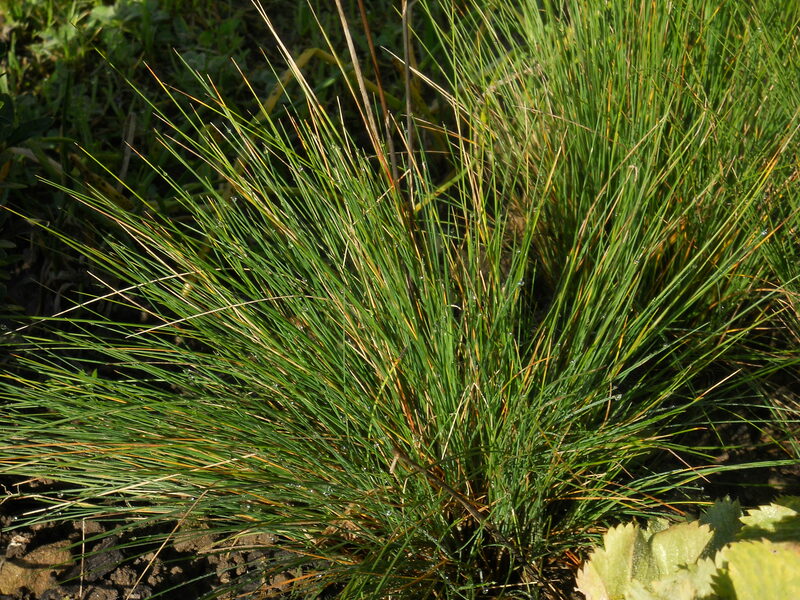 Good value for one plant – and just as well it’s so tough it can put up with that beating. Finally I did let it flower and then harvested the seed heads to use in the kitchen – but I suspect it’s already had a go at moving beyond the wire baskets. 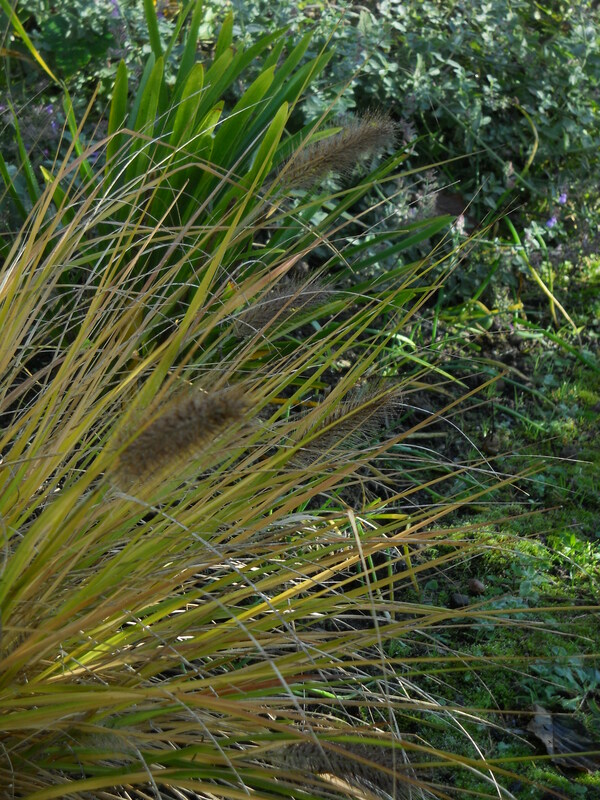 And lastly a few grasses that I don’t consider weeds. To the left, Pennisetum alopecuroides, and to the right some little seed-grown Festuca amethystina that should really be into their stride by next summer. Finally, looking classy with borage, Miscanthus sinensis ‘Morning Light’. This post is my third on the new blog. And do you know, I’m already missing that feeling of having my garden around me that I had on my old Weebly Garden Dreaming at Châtillon site. This is also my contribution to Pam Penick’s Foliage Follow-up at Digging – if you check out her site you’ll come across foliage vastly more exotic than mine! And I’d love to hear about the garden thugs you wouldn’t be without? This entry was posted in Anything and everything!, Foliage follow-up, Voles on November 16, 2014 by Cathy.